The Chevron Houston Marathon offers participants a unique running experience in America's fourth largest city. The fast, flat, scenic single-loop course has been ranked as the "fastest winter marathon" and "second fastest marathon overall" by Ultimate Guide To Marathons. 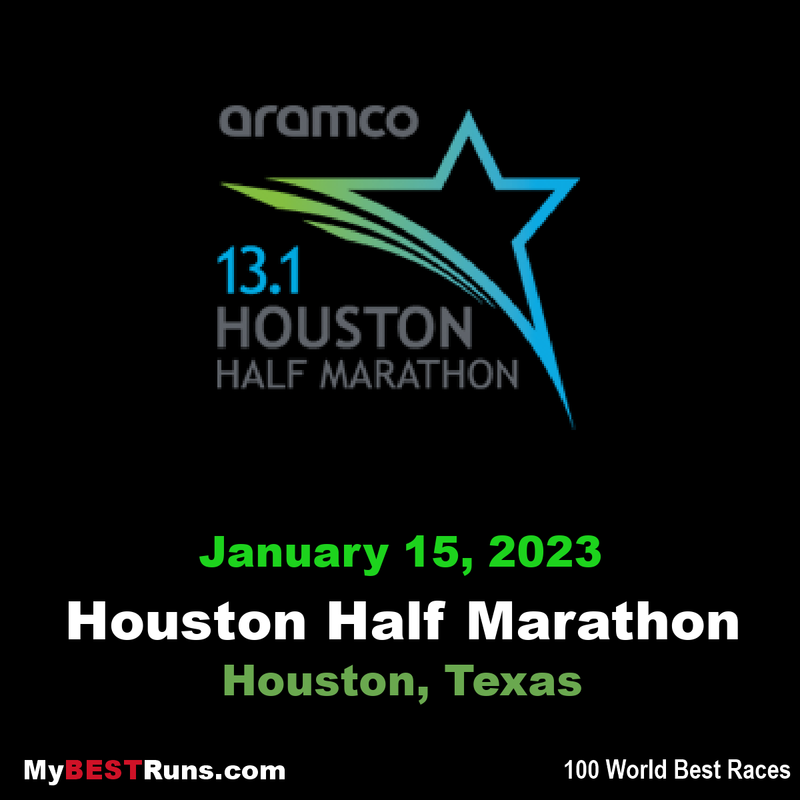 After 30 years of marathon-only competition, Houston added the half-marathon in 2002, with El Paso Energy as the sponsor. Today the sponsor is Aramco. The 13.1-mile race was immediately popular, with more than 2,500 finishers, but the first race didn’t present a dramatic finish. Emily Sissonbecame the second fastest half marathon American woman in history today in Houston. Just two days after announcing her plans todebut at the London Marathon, Sisson finished fifth overall in a time of 1:07:30 at the 2019 Houston Half Marathon. Her performance on Sunday was just five seconds shy of the American record of 1:07:25set by her mentor Molly Huddle in Houston last year. Despite the windy conditions and the confusion with pace at certain points on the course, Sisson still managed to finish just five seconds shy of the American record in a new personal best of 1:07:30. The performance improved on her previous best by almost a full minute. 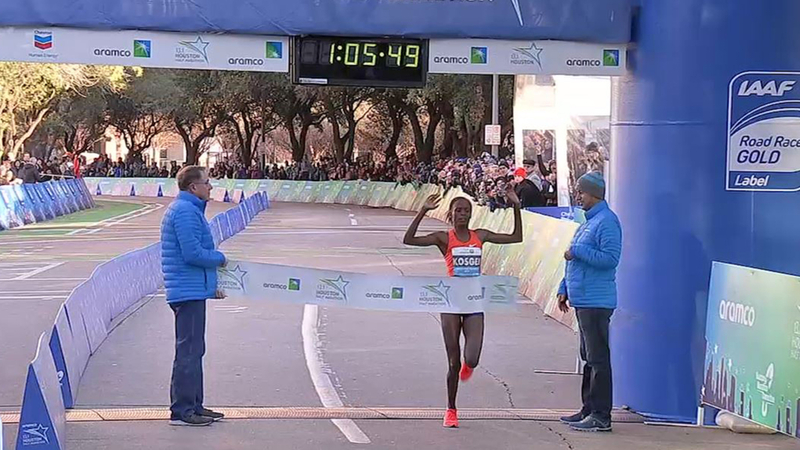 On a cold day when Ethiopian athletes won three of the four elite races, Ruti Aga’s 1:06:39 victory in the Aramco Houston Half Marathon was the most notable, as the IAAF Gold Label road race on Sunday (14) proved to be one of the deepest half marathons in history. New Zealand’s Jake Robertson prevented an Ethiopian sweep of the titles by winning the men’s half marathon in 1:00:01. Paced by Gotytom Gebreslase, a lead pack of eight women passed through the first five kilometres in 15:48, suggesting a finishing time comfortably inside 67 minutes. As the pacemaker hit the 10-kilometre checkpoint in 31:33, she was still joined by seven other women: Aga and fellow Ethiopian Buze Diriba, Kenya’s Edith Chelimo, Caroline Chepkoech, Eunice Chumba, Mary Wacera, and USA’s Molly Huddle. Although the pacemaker dropped out after the half-way point, the lead pack continued at much the same pace, passing 15 kilometres in 47:28. With little more than a couple of kilometres left, Aga began to make her move. At 20 kilometres, reached in 1:03:13, the 23-year-old had a three-second lead over Chepkoech while the rest of the lead pack had fragmented. Aga extended her lead in the closing stages, winning in 1:06:39 to come within 10 seconds of the North American all-comers’ record set by Wacera in Houston in 2016. The 2012 world U20 5000m silver medallist took more than a minute off her previous PB, but her 2:20:41 second-place finish at the Berlin Marathon in September had suggested that her half-marathon PB was due for revision. Chepkoech, who last year set PBs of 14:27.55 for 5000m on the track and 30:45 for 10km on the roads, was rewarded with another big PB. The 24-year-old finished second in 1:06:48 in what was just her second half marathon to date. Wacera and Diriba finished third and fourth respectively, both awarded the same time of 1:06:50, a PB for the latter. Chelimo and Chumba followed, clocking 1:07:13 and 1:07:18, both women recording the second-fastest times of their careers. Huddle finished seventh in 1:07:25, but found consolation in the fact she broke Deena Kastor’s North American record. Her times at 10 miles (50:52) and 20 kilometres (1:03:48) are also continental records. It was the first half marathon in history in which seven women had finished within 1:07:30. The men’s half marathon played out in much the same way as the women’s race, only the numbers involved at the start were higher. After a large lead pack of about 25 runners covered the first five kilometres in 14:23, the pace started to pick up and the 10-kilometre point was reached in 28:32 with 13 men still in contention. Aside from Robertson, others in the lead pack included Ethiopia’s Guye Adola, Feyisa Lilesa and USA’s Sam Chelanga. The likes of two-time world champion Bernard Lagat and London Marathon winner Daniel Wanjiru had already started to drop behind. The lead pack remained largely unchanged as 15 kilometres was reached in 42:50 with Adola and Robertson still running comfortably within the large lead pack. With just a few kilometres remaining, though, Robertson began to make his move and by 20 kilometres he had a 10-second lead over Adola. Robertson extended his lead by the finish, winning in 1:00:01 to match the PB he set on his debut at the distance when winning in Lisbon last March. Adola finished second in 1:00:15 and was followed by fellow Ethiopians Lilesa and Shura Kitata, both clocking 1:00:20. In a year that saw Houston host the Olympic Trials marathon and gain worlwide attention, a pair of Ethiopian youngsters rampaged through the half marathon record books. Feyisa Lelisa and Belaynesh Oljira broke course records held by a couple of familiar names: Lelisa’s 59:22 edged the mark set by American Ryan Hall (59:43) in 2007, while Oljira’s winning time of 1:08:26 shattered the mark set by American Shalane Flanagan (1:09:41). Lelisa, a 21-year-old who won the marathon bronze medal at the 2011 IAAF World Championships, was a late entrant, but had little trouble handling the field. Ethiopian Tilahun Regassa was runner-up, in 1:01:28, with American Scott Bauhs on his heels in a personal best 1:01:30. In fourth was Luke Puskedra in 1:01:36, a senior at the University of Oregon who was making his half-marathon debut. The women’s race was another matter. Oljira and Kenya’s Caroline Kilel, winner of the 2011 Boston Marathon, ran shoulder-to-shoulder right to the end, with the 21-year-old Oljira, running her first race in the United States, using her 10,000-meter speed to win in a sprint. “Right from the beginning I was following her and I knew, and I prepared in my mind, that I have to sprint very fast at the last 100 meters or so,” Oljira said. Joan Samuelson, 1984 Olympic gold medalist in the marathon, finished in 1:38:03. Running in wet and cold conditions, course record-holder Feyisa Lilesa of Ethiopia defended his title in the men’s race and countrywoman Mamitu Daska, the 2011 marathon champion, won the women’s crown. Daska became the first-ever woman to win the marathon and the half marathon at Houston. Lilesa ran side-by-side with Deriba Merga until the pair entered the home stretch, where Lilesa used his superior speed to win in 1:01:54. Merga was second at 1:02:00 and Kenya’s Wilson Erupe made a late surge to take third in 1:02:12. Daska took command early in the race, leading through 5km in 16:18, and then doubled her margin by the 10km mark, clocking 32:42. At 15km, she had a 1:27 lead over Caroline Kilel of Kenya and her margin of victory was 2:05 when she crossed the line at 1:09:54, the fifth-fastest time in race history. Kilel finished as the runner-up for the second year in a row, finishing in 1:11:58 and Hellen Jemutai, also of Kenya, was third in 1:12:34. The top Americans were newly-minted U.S. citizen Shadrack Biwott, who finished fourth in 1:02:23, and Lisa Uhl, who took sixth in 1:13:38. Houston once again hosted the USA Half Marathon Championships, this time on a new course with superb weather, and Meb Keflezighi broke away from the field after the eight-mile mark to win in 1:01:23, his second U.S. title and the second-fastest time in race history by an American. It was Keflezighi’s 22nd U.S. title at all distances. Keflezighi ran with a large pack for the first half of the race, trading the lead with last year’s top American finisher, Shadrack Biwott, and Tyler Pennel. Aaron Braun and Tim Ritchie pulled the field through 5K in 14:38, and a group of seven men led by Pennel passed 10K in 29:10.By 15K Keflezighi gapped the pack by three seconds at 43:34, and he added nine seconds to that margin over the next 5K to clock 58:12. Braun and Josphat Boit edged past Pennel over the final kilometer to finish second and third in 1:01:38 and 1:01:41. Serena Burla mounted the podium for the first time, winning the women’s title in 1:10:48 as she ran almost unchallenged for the majority of the race. A pack of eight cruised through 5K under 17:03 with Burla at the front. Burla made a strong push in the next 5K to take a 15-second lead over Lauren Kleppin at 10K, and by 15K that lead had stretched to 40 seconds at 50:07. She went through 20K at 67:08 and had a 1:18 margin, which increased to 1:24 at the finish, with Kleppin second and Caitlin Comfort third at 1:12:16. Two very different races produced two superb results in races which served as the U.S. championship race for the ninth time for men and seventh time for women. Diego Estrada shot to the lead after running with the pack for the first 5K at 14:41, opening a 20-second gap by 10K (28:51) and stretching that margin to 45 seconds over Jared Ward at the 15K mark (43:14). He tacked on five more seconds to his cushion by 20K (57:45) and eased to the finish at 1:00:51, the third-fastest time ever by an American and also the third-fastest ever at Houston. Ward finished well to clock 1:01:42 in his debut at the distance to move to ninth on the all-time Houston list, and Girma Mecheso was third at 1:02:16. Three-time champion Meb Keflezighi was fighting a cold and a sore back as he pursued his fourth U.S. title and third straight, but battled through to take fourth at 1:02:18. Kim Conley, a gold medalist in the 10,000 at the 2014 USATF Outdoor Championships, bided her time through 10 miles at a fast pace, running with the leaders through 5K at 16:45 and 10K at 33:27. She shared the lead with 2006 U.S. champ Annie Bersagel at 15K (50:08) and then pulled away over the next 5K, running 16:12 for that portion of the race to pass 20K at 1:06:20 and take a 22-second lead. Conley was powerful through the finish, crossing the line at 1:09:44 for the fifth-fastest time ever at Houston and the second-fastest by an American woman in the race. Brianne Nelson trimmed more than two minutes off her lifetime best to take second at 1:10:16, and Janet Bawcom was third at 1:10:46. Kenya’s Mary Wacera ran the fastest-ever women’s half marathon on American soil Sunday, moving to No. 9 on the all-time world list as she shattered the course record with a 66:29 to win the Aramco Houston Half Marathon. Wacera, who collected $45,000 for her record-setting win, made a move just after the 15-kilometer mark to take the lead from fellow Kenyan Cynthia Limo. She established a six-second gap over the next 5K and stretched the margin to 12 seconds at the finish. Limo’s 66:41 moved her to 11th on the all-time world list. Last year’s world marathon champion, Mare Dibaba of Ethiopia, was also faster than the existing course record with a 1:07:55 in third, as was fourth-placer Ruti Aga of Ethiopia, who clocked 68:07. Sara Hall was the top American woman, setting a lifetime best with her 70:07 in fifth. Lelisa Desisa of Ethiopia ran the third-fastest men’s time ever at Houston, winning by eight seconds with his 60:37. Mosinet Geremew of Ethiopia was the runner-up at 60:45, and Luke Puskedra took the top U.S. spot in fourth at 61:29.